8. How Do We Analyse the Impact of Transmission Blocking Interventions? Chapter Six. Is Predominant Clonal Evolution a Common Evolutionary Adaptation to Parasitism in Pathogenic Parasitic Protozoa, Fungi, Bacteria, and Viruses? 6. How can clones survive without recombination? 7. Meiosis genes and experimental evolution: what do they tell us about predominant clonal evolution? 8. Is predominant clonal evolution an ancestral or convergent character? Advances in Parasitology presents the latest developments in the field of parasitology. It covers topics such as Chagas Disease Diagnostic Applications, The Role of Spatial Statistics in the Control and Elimination of Neglected Tropical Diseases in Sub-Saharan Africa, and Host–Parasite Relationships and Life Histories of Trypanosomes in Australia. 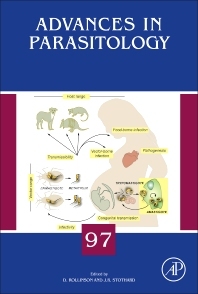 Specific chapters delve into targeting parasites to suppress malaria transmission and a focus on neglected tropical diseases, such as Trypanosomiasis, Schistosomiasis and Lymphatic Filariasis. This series includes medical studies of parasites of major influence, such as Plasmodium falciparum and trypanosomes, as well as reviews of more traditional areas, such as zoology, taxonomy and life history.